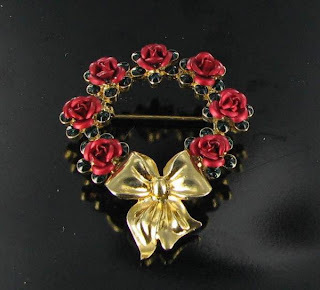 Many of you know of the name Avon for perfumes and other body products, but Avon has also been making jewelry as a part of their line since the early 1970s. Mrs Persis became the company's first "traveling sales lady" and soon doorbells across America could be heard along with the recognizable words "Avon Calling." By 1928, their products were being sold with the new name - Avon, but still through the direct marketing method. The name of the company was officially changed in 1939 to Avon Products, Inc. The following years showed a huge increase in sales, with all products still being beauty product based. In 1971, Avon began offering jewelry to their customers, and this trend continues through today. Avon jewelry is now sold in a variety of ways, including the internet, but most of their business still comes from direct sales. The most collectible part of the Avon jewelry line includes designs by several well known designers, such as Kenneth Jay Lane, Elizabeth Taylor, Barrera, Coreen Simpson, Celia Sebiri, etc. These designs are always marked as "name of designer, for Avon." The Avon jewelry line included a wide range of styles such as watches, earrings, brooches, bracelets and necklaces. They also regularly feature a line of holiday themed jewelry. Some of their numbered Christmas tree pins are very collectible. 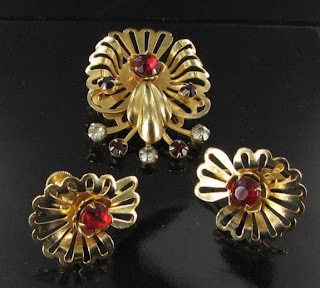 Avon jewelry is readily available and not particularly valuable, but is interesting to those who collect Avon Memorabilia. 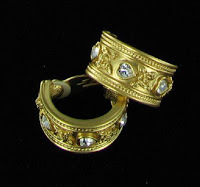 One should only purchase pieces in excellent condition, in original boxes, if possible. 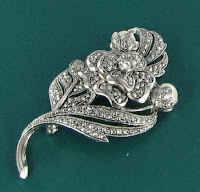 Prices most likely to increase in value are those by the noted designers such as KJL, Elizabeth Taylor, etc. It's a new year and time for some January jools to kick off the year in style. One of these might be just the piece to use some of that money that you may have received for Christmas. 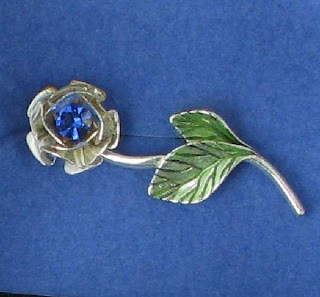 This fabulous pinwheel brooch is a real stunner. It's made of marquis and chaton rhinestones in a domed design with super clear and bright diamante rhinestones. 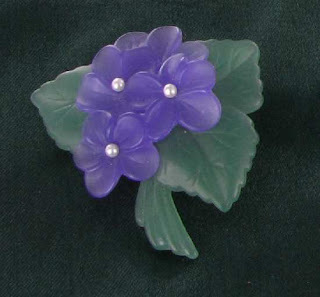 It's available at The Finishing Touch Vintage Jewelry for only $35. How about this fabulous demi with red rhinestones? It might be just the perfect Valentine's day gift to yourself! Also available at the Finishing Touch for $35. 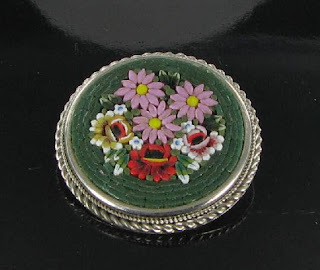 For the romantic person who loves flowers, this fabulous micro mosaic brooch might be just the stunner that you are looking for. Perfect to wait out the cold winter months until the flowers bloom again. 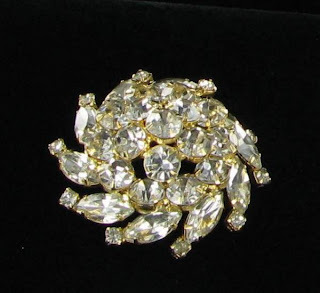 It's $45 and is available at the Finishing Touch Vintage Jewelry. The birthstone for January - garnet, is a stone that is generally thought to be blood red, but can be found in a wide color choice. To get an idea of the normal garnet color, break open a pomegranate and inspect the tiny glossy red seeds inside the fruit. After doing this, you may understand why the word garnet comes from the Latin word "granatus" which originated when garnet grains in rock were compared to the dark red seeds of the pomegranate fruit. To the ancient gemologists, the garnet was a tiny glossy red gem, which was just bursting with fire and brilliance. Garnets are formed in nature when high temperatures and/or pressure are present. It can be any density from transparent to opaque and has a specific gravity between 3.4 and 4.3. Garnets have been used as gemstones in jewelry for thousands of years. Even though people tend to think of a garnet as a blood red gemstone mentioned above, it actually occurs in every color except blue. The varieties are named for their color with names such as rhodolite (purplish red), hessonite (orange, cinnamon, or pinkish variety) and tsavorite (dark green) etc. Garnets are of moderate hardness, ranging from 6.5 to 7.5 on the Mohs scale of hardness. However, garnets lack cleavage, so when they break, they fracture into sharp, irregular pieces. Their durability and hardness make them popular gemstones for jewelry. These gemstones are mined all over the world but the largest deposits are found in the Arizona, Australia, Brazil, South Africa, Argentina, Burma, Scotland, Switzerland and Tanzania. Unfortunately, many garnets mined are not of sufficient quality to be used in fine jewelry. The garnet is the gemstone for those born in January and is also that associated with the Zodiac sign Aquarius. It is often given as a gift for the second or 6th wedding anniversary. For those interested in metaphysics, the garnet has a long folk lore history tied to it. It is thought to have powers that affect healing, strength, and protection. Many people wear it to relieve inflammations of the skin, and is believed to regulate the heart and blood flow and aid in curing depression. Are you a January baby? How lucky you are to have this wonderful gemstone associated with your birth month.